CONTEST ALERT! 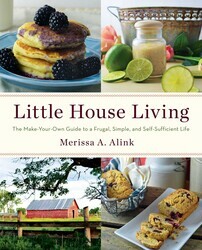 In light of the new season, Little House Living blogger and author Merissa Alink shares with us her favorite family-friendly fall activities, and gives you a chance to win some of her favorite goodies from her new book, LITTLE HOUSE LIVING, on sale from Gallery Books 10/20! The days are shorter, colder, and our yard is littered with colorful foliage. In anticipation for winter, our family has been trying to fit in as many fun outdoor activities before the snow starts flying. Fall is a great time to do things together outside as a family because it’s not as warm as the summer and you can come home to apple cider when you are done! Here are some of our favorite fun activities that we are doing this fall. Going for a fall bike ride. Even in a small town it’s easy to find a bike path, sidewalk, or a place that you can go bike riding. Pack up a few snacks (apple slices and pumpkin seeds are a great little fall snack!) and take an afternoon bike ride together. Make sure to collect the most beautiful leaves that you see along the way so you can preserve them when you get home (place the leaves in clear contact paper) to remember your fun afternoon family time. Go apple picking (or pumpkin picking together). Apples are in-season right now and taste wonderfully fresh! Take advantage of the season and take your family to a local apple orchard to go apple picking. Our family just did this together last weekend and it was so fun. The orchard even had goats in a pen with a big ladder and bridge to climb over so it was fun for the kids to watch. A bonus here is that these apples are generally more inexpensive than those at the grocery store (plus they are fresher!) so make sure to stock up while you are there! Add new books to your collection. Since we spend more time indoors in the winter, fall is a great time to grab some new books to read together. For inexpensive books, search for used books at library book sales, watch for book deals through your child’s school or book fairs, or search online for used books from places like Amazon, Thrift Books, and Half Price Books. If you’d rather not spend any money on books this fall you could instead take the time to make a list of all of the books that you want to read this winter from your local library. Take time to jump in the leaves. Don’t clean up your yard too quickly, make sure to savor the time by making a big pile of leaves and jumping in it with your kids. Don’t let them have all the fun! To enter the LITTLE HOUSE LIVING contest, answer this question in the comments below: what is your favorite fall activity to do with your family? Sweepstakes ends October 26th, 2015. For official rules, click here. *PSST! Want even more LHL? Check out her post on Tips on Healthy Living–and don’t miss their Joy of Cooking contest! From the immensely popular blogger behind Little House Living comes a motivational homemaking book, inspired by Laura Ingalls Wilder's Little House on the Prairie, featuring creative, fun ways to live your life simply and frugally. I love visiting http://www.applehill.com/ with my family. There’s so much to do: over 50 ranches including fruit growers, bake shops, wineries, a spa and Christmas tree growers. We love exploring everything that’s on offer. Nothing like some crisp mountain air, delicious food, and togetherness to make me enjoy autumn! I love sitting by a fire and roasting marshmallows. Fall is probably my favorite season. I love going to bonfires and hanging out with the friends. Another favorite is hanging outside by the fire with my bestie with a glass of wine in our hands. Enjoying the leaves change color and taking walks in the cooler weather. Apple picking and pie making! Carving pumpkins and sipping coco. We like to go for long drives in the suburbs/country and stop at little food stands. I live in San Diego County, so the weather stays pretty nice here.